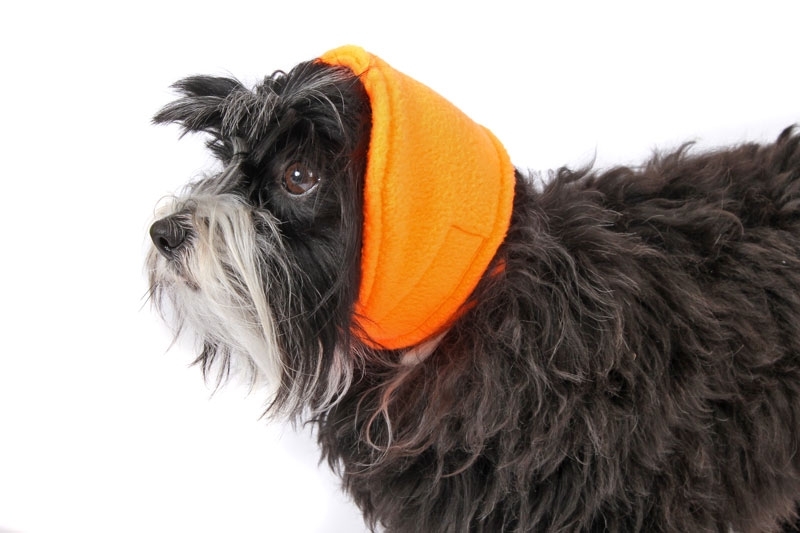 Keep your dog's ears warm with the Ear Coozie.™ Based on the concept of the koozie for soda/beer cans, this Coozie wraps around your dog's head and ears to keep them warm. Made of soft, anti-pill polar fleece. Easy-on and adjustable. Velcro® closures which allow you to fasten the Coozie snuggly under the chin. Machine washable/dryable. Note: It may take some dogs a little while to get use to wearing the Ear Coozie. With our test models, once we got going on our walk, they forgot about it! 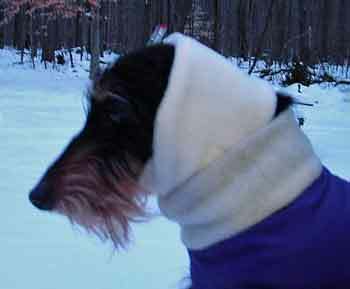 And their ears were protected from the cold and snow. Please allow 2-3 weeks for production & delivery of our custom-fit/made products. I got this for my very elderly smooth mini doxie. We live in the mountains of CO and have lots of snow but in the winter it is the wind that just cuts through you. Poor Phoebe would come in with very cold ears and the ear coozie really helps. I love all the products I have ever bought or seen from Dachshund Delights. They have the highest quality and are 'tailored' for your dog. The snuggle sacks for beds are the very very best ever made. Plus they have wonderful communications. I don't even look anywhere else when I need something for my doxie! Ear Coozies for Cold Weather! Unfortunately, we waited too long to order this, & the weather warmed up too much to be able to use this this spring, but we are looking forward to next winter. 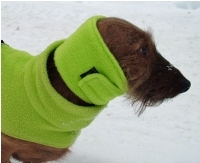 We ordered the Hug-A-Dog Harness® Dachshund Coat (Water Resistant) & wanted an option to keep the neck area warm ( the coat neck is cut lower) This works perfectly when paired with the Hug-A-Dog Harness® Dachshund Coat (Water Resistant) to add extra warmth. We ordered it larger to make sure it fit down over the neck. I cant say enough about the Hug a Dog products, they are fantastic quality, functional, look great, lots of color options, fit great & you get all this for a very reasonable price!! Very nice item for doxie ears. Our smooth coated doxie has very little hair on his ears. This is wonderful for him on these frigid days. I am pleased with the hug-a-dog ear coozie. It fits perfectly. It took my dachshund a little while to get use to something on his ears. Now that he has worn it for a while, he seems to enjoy having his ears warm. He rides in a mule with us throughout the year, and he when it is cold outside, his ears are not blowing in the cold wind. Love this item! Very warm and cozy.